I'm guessing that I'm not the only person out there that can see nail art in almost anything. When I paintings, or fabric or patterns I instantly see how it can be translated into nail art. Take this example. 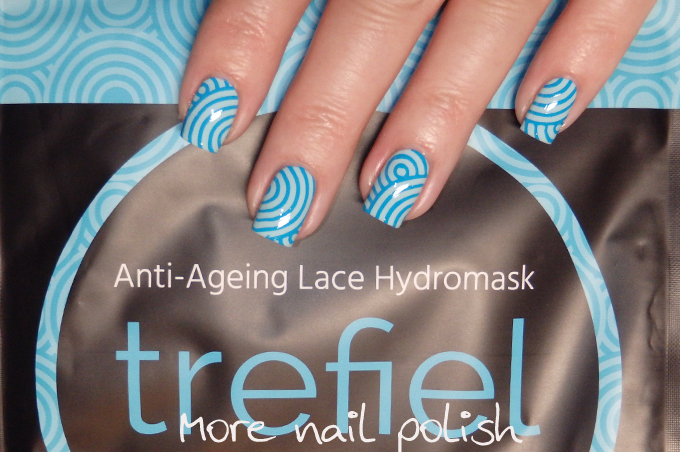 This is the packing for the Trefiel Hydromasks that I showed yesterday. 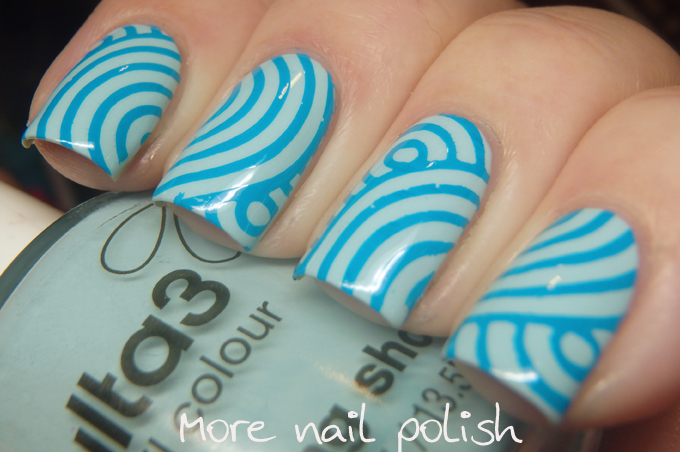 When I saw that teal circular pattern on the package I knew I wanted to create some nail art with that on it. I actually had two stamping plates that would have been perfect. One was a plate that had this near exact design in a much smaller print, so it would have shown full circles on my nails, and then there was this one on a random Born Pretty store plate that had the large partial circles. I liked the idea of the larger partical circles better and I'm really happy with the look, as I don't think the smaller full circles would have looked as striking. My base polish is Ulta3 Spring Shower, man I haven't pulled out an Ulta3 in ages, in fact I haven't bought an Ulta3 in ages either, I'm not even sure what new collections they might have out. The stamping polish was a Mundo de Unas teal colour. Haha, sometimes it happens to me too, but I rarely execute the idea. I love this design very much!